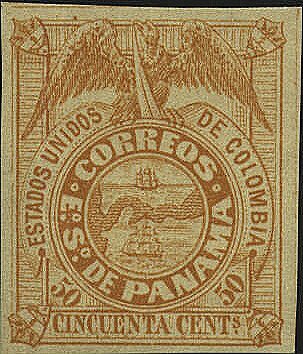 The first stamp of Panama issued by the Sovereign State of Panama Under Colombian Dominion in 1878 features a design that based on the coat of arms of Panama at the time. It has been described as "a Panama that never existed." The dramatic curve up and then back down on the left side of the design does nnot exist, nor does the bay created by those curves. On the right side of the design the coast should tend to the lower corner of the stamp. A comparison with any map of the isthmus will verify the judgement. Stamps with a different but similar design were also issued in 1878. The map in this design is not correct either.